Today Is NOT the ONLY Day of Salvation! More than seven million copies sold last year. Forty different companies print this Book and the total number of hundreds of millions of copies printed and distributed is impossible to estimate. It has now been translated into over 1400 different languages. Consistently every year's best seller by a very wide margin, the Bible is the most-printed, most-purchased, most freely distributed, little-read and certainly least-understood book known to man! Bruce Barton referred to it as "The Book Nobody Knows. 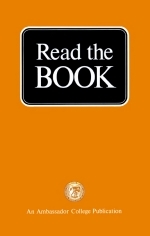 , You need to know this Book; to know it you have to read it. WHY are there so many Bibles? If you could make a survey of the use of the myriad millions of Bibles that have been printed, the results would astound you. Think about it a minute — what are all those Bibles being used for? If you determine to read the Book, it will be the most rewarding thing you've done in a long time. Every article that you read in The PLAIN TRUTH and other literature you receive from Ambassador College will come alive more than ever before. You will for the first time be able to follow the example of the Bereans as mentioned in Acts17:10-11, where they listened to what Paul had to say when he preached the Gospel of Jesus Christ. Then they "searched the scriptures daily" to confirm the things he said. One personal request-I would appreciate very much hearing from you to know whether or not you are indeed going to read the Book. And when you finish, I would very sincerely appreciate hearing that you have accomplished what you set out to do. "Oh, I just can't remember scriptures!" is the anguished cry of many who do read the Book. Just how important is the ability to memorize hundreds of verses? And how can you develop and improve your ability to recall scriptures? MANY have suffered needless frustration because of fruitless efforts to retain certain passages of Scripture in their memory. Perhaps you have tried and repeatedly failed to commit to memory important verses from our Maker's Instruction Book. Is Memorizing Word for Word Necessary? Let's understand that salvation does not depend on one's ability to quote chapter and verse from the Bible! If it did, it is conceivable that none of the original apostles and authors of the New Testament would ever have qualified for the Kingdom of God! Why? Because in the days of the twelve apostles and the writers of the New Testament, the Old Testament writings had not yet been divided into chapters and verses. In fact, it was not done until long after those men were all dead! The sole exception to this was the Book of Psalms. The Psalms are actually songs. They were composed by a number of authors and originally intended to be set to music. Therefore it was necessary to divide them into chapters and verses for musical and poetical expediency. And as songs, of course, they were intended to be memorized. For ease of memorization the verses were sometimes arranged acrostically (alphabetically). Now consider this fact: The New Testament authors quoted directly from the Psalms 116 times — yet in only one instance did they mention the chapter from which they were quoting! This one case is Acts 13:33: "... as it is also written in the second psalm...." The remaining quotes from the Psalms make no mention of either the chapter or the verse. Other than those from the Psalms, the New Testament contains 167 more direct quotations from the Old Testament and, of course, no chapter or verse is referred to in a single instance. In some cases, when quoting from the Old• Testament, the speaker or writer did not even mention the name of the person or the book he was citing. Take, for example, the time when Jesus Christ was being tempted by the devil. Jesus quoted directly from the Book of Deuteronomy, which was written by Moses, yet he did not even mention the author or the name of the book! Check that for yourself in Matthew 4:4, 7 and 10. In other instances where the prophets of old are referred to, they are simply mentioned by name, but, of course, no verses or chapters are given. For some examples, read Matthew 2:17; 8:17; Luke 4:17. The Bible was not divided into chapters until about 1250 A.D. when Cardinal Hugo composed a Latin concordance or index of the Scriptures. Over 300 years later, in 1560 A.D., the first Bible translation wholly divided into chapters and verses was produced in Geneva, Switzerland. It was known as The Geneva Bible. It should be apparent, then, that the ability to quote chapter and verse from the Bible like a human computer is not necessary. If, however, a person is gifted with an exceptional memory for scriptures, it is certainly to his advantage if he exercises his ability in right humility for an honorable purpose. There is absolutely nothing wrong with having an excellent memory! We are told to "grow in grace and in knowledge" (II Peter 3:18). As Christians, we should be continually increasing our knowledge of God's Word. Peter also instructs us, ". .. be ready always to give an ANSWER to every man that asketh you a reason of the hope that is in you with meekness and fear" (I Pet. 3:15). Memory is therefore one of the important attributes that God has given to humans. For most people, however, remembering does not come easy. It seems many have difficulty retaining even the simplest things! Perhaps YOU have that difficulty. If so, then you can take heart from this fact: Even though most of the Bible was not originally written with chapters and verses, the Bibles we use today ARE! And since they are, we can certainly take advantage of this valuable aspect of modern translations. The present chapter and verse divisions DO make it easier to locate the scriptures we need, and to do it in a systematic way without having to wade through whole books and sections of the Bible to find them. By increasing our memory of scripture locations, we can improve our overall knowledge of God's Word and be better able to "rightly divide the word of truth" (II Tim. 2:15). We should stand in awe of the authority of the scriptures inspired by the great Creator of mankind! We should tremble before the Word of the living God! (Isa. 66:2.) We should FEAR to misuse, twist, or misquote the Bible! A fast, flippant answer, hastily given to "save face," is often inaccurate and wrong! Therefore it is important that we come to REALLY KNOW OUR BIBLES and develop the ability to use them correctly as Peter said. It may be impressive to be able to "rattle off" dozens of scriptures from the Bible. But it is MORE impressive and vastly more profitable to have a GOOD UNDERSTANDING of the Scriptures! Solomon, in his God-given wisdom, recognized the transcendent importance of gaining understanding. He said, "... lift up your voice [pray] for understanding ..." ". .. HAPPY is the man that findeth wisdom and the man that getteth UNDERSTANDING." He said we should "... get UNDERSTANDING" (Prov. 2:3; 3:13; and 4:5). There is a tremendous joy and a sense of exhilaration in realizing you have grasped and understood a spiritual principle for the first time! Why is it so much more important to have understanding of the Scriptures than merely to be expert in locating and quoting them? Simply because the ability to cite verses and chapters from the Bible I merely a mechanical operation. But comprehending their meaning is a SPIRITUAL accomplishment! Read Romans 7:14 and I Corinthians 2:14 in this connection. Surely you can see that the important thing is to STUDY FOR UNDERSTANDING, and not merely to memorize by rote! Of course, it is also fine to want to increase your skill and ability in rapidly locating and citing scripture verses. And since it is, here are some pointers that will help you — if you practice them habitually — not only to understand, but also to be better able to recall verses of the Bible. But before we begin expounding these pointers, one caution should be mentioned here for our senior citizens. When an older person tries to remember past events, his or her memory is much sharper in recalling events of childhood and early adulthood, than in remembering events of ten years ago or of even a relatively short time ago. Human beings learn more the first year of their lives than any succeeding year. Each year they learn a little less than the year preceding. Therefore, it follows that students can learn more readily — pick up new knowledge in a new field faster — than their professors of a much riper age. But this does not mean that young students know more than their professors! Not at all. For the elderly have the accumulated knowledge of many more years, plus much added experience. So, senior citizens should not be at all discouraged because they cannot recall scriptures as rapidly as younger people. Our just God judges us on what we do with our individual abilities — NOT on how we compare with others. With that brief digression, we begin expounding and explaining several helpful points on how you can better understand and memorize scriptures. In order to get the overview of the Bible, you should at your earliest opportunity quickly read through the ENTIRE BIBLE from Genesis to Revelation. Studying just bits and pieces, here and there, .will never enable you to grasp the broad picture — the panorama of the Bible. To read the whole Bible through, you need to set up a program. Review Part I of this booklet for details. Many chapters in the Bible were made chapters because of a natural subject content. For example, I Corinthians 13 has been called the "love chapter" because it primarily deals with that subject. Exodus 20 and Deuteronomy 5 both discuss the Ten Commandments. Revelation 20, I Corinthians 15 and I Thessalonians 4 are concerned with the resurrection. Hebrews 11 is known as the "faith" chapter. Psalm 51 is David's psalm of repentance after his sin with Bathsheba. Psalm 119 deals extensively with the Law of God. Isaiah 11 speaks in detail of the millennia! reign of Christ. On and on we could go. It is easier to remember the subject of an entire chapter than individual verses. But to really remember what is in entire chapters, you need to familiarize yourself with them by STUDYING and poring over them. Doing this will help your overall ability to retain Bible knowledge! And when you do learn the overall content of some of these basic chapters, you will begin to more rapidly locate individual scriptures on the subjects covered in them. If you were driving a nail into a board and you tapped very lightly on it with the hammer, it would not penetrate the wood very deeply. Your mind is the same way. Our minds adequately retain for instant recall only those things that have left a DEEP IMPRESSION on them. Unless you are sufficiently impressed with something the first time you hear or study it, chances are it will soon fade from memory. Therefore, you must allow the verses you are studying to make a DEEP MENTAL IMPRESSION! If you are merely reading superficially over verses ,simply skimming them, they will leave little or no impression! There is a proverbial saying to the effect that if you eat Chinese food, half an hour later you will wonder what you ate. If you study superficially, half an hour later you will wonder what you read! It is imperative, therefore, that you dwell on and CONCENTRATE INTENSELY on what you are studying! Let the words of the Creator sink deeply into the innermost recesses of your mind. Do not allow your Bible study to be merely academic or impractical. Relate what you are studying in the Bible to actual situations in this life. Relate it to history or future events in world affairs. When you study prophecy (about one third of the Bible deals with prophecy) ask yourself, "Has this ever happened? Is it happening now? Or is it yet future?" Then, as you read the daily newspaper, and as things happen on the world scene, certain verses from the Bible will spring to mind! When you study a section in the Book dealing with a law or some aspect of Christian conduct, ask yourself, "Am I obeying this? How can I perform this?" Then when you come up against a situation in daily life which involves that principle, the verse will come to mind. If in your mind the Bible is relevant to life, both past and present, its verses will spring to LIFE! They will become LIVING ORACLES which have a definite BEARING on human life in general — and yours in particular! This will make them much easier to retain and recall. The old cliche "out of sight, out of mind" applies here. After you have closed the Book, unless you continue to mentally digest its words, they will tend to fade from conscious thought. They will be crowded out by other things. The example of King David of Israel applies in this case. He said, "Oh how love I thy law! It is my MEDITATION ALL THE DAY" (Psalm 119:97). David's mind was perpetually on the things of God. Not to the exclusion of his responsibilities as administrator of the kingdom, but INCLUDING those principles in his rulership as well. God's Word is TRUTH (John 17:17). We are admonished by the Apostle Paul to THINK ON (meditate on) the truth (Phil. 4:8). The more you do this, the more the verses and chapters of our Maker's Instruction Book will become real "MIND STICKERS"! To "drill" is to indulge in mental exercise aimed at perfecting facility and skill by regular practice. Drilling yourself in the verses of the Bible is one of the finest ways of committing them to memory. Many have found the use of "flash cards" helpful in this respect. These can be made very simply by purchasing a supply of 3x5 index cards and writing or typing the scripture out in full on one side, and then the chapter and verse location on the other side. Use these cards for key scriptures you wish to recall. Go through the cards regularly by reading the quote and then trying to recall its location by chapter and verse. Then turn the card over and check on yourself. You could reverse this process by reading the chapter and verse first and then trying to recall its wording. Since every translation varies, don't necessarily try to memorize word for word, but just the key thought, subject, or point of the verse. This method will provide you with a helpful REVIEW of the scriptures and is a valuable means of aiding your memory. Drill yourself also on the subjects of basic chapters such as those mentioned earlier in this booklet. You'll find that REPETITION is indeed the best form of emphasis! Jesus Christ promised His disciples: "But the Comfor ter (Greek paracletos — "one called alongside to HELP"), which is the Holy Spirit, whom the Father will send in my name, he shall teach you all things, and bring all things to your remembrance, whatsoever I have said unto you" (John 14:26). God's Spirit is intended to help and assist you in both understanding and recalling to mind the words of Jesus Christ. Utilize that help. Ask God to help you apply the principles in this booklet daily. Practice them and work on them faithfully. Develop right study habits and stand in awe of the words of the living God. As you continue to submit to God and respect His Word, He will help you in your efforts to study and retain scriptures. Don't become discouraged if you don't become a "walking concordance." Remember the ability to understand scripture is vastly more valuable than the ability to merely quote it!